Just like rice, fish sauce is a staple of almost every dish in Vietnam. “For Vietnamese people, a meal without fish sauce is considered incomplete,” culture expert Tran Ngoc Them once wrote in his book Vietnam Culture Foundation. 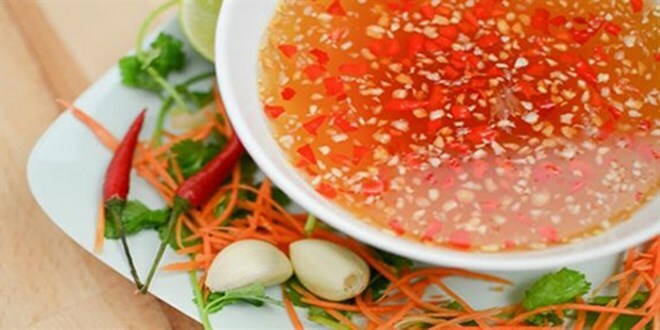 A bowl of fish sauce, nuoc mam, is placed at the centre of the table so every one can reach it. Some may not eat vegetables, some may not have meat, but everyone has rice and seasons the food with fish sauce. Therefore, how one places the fish sauce bowl can tell a lot about etiquette and consideration for others, according to Them. The earliest mention of fish sauce is found in Roman literature in the 4th century BC. Nowadays fish sauce is popular in Southeast Asian countries – in Thailand it is known as nam pla, in Myanmar as nganpyaarrai, in the Republic of Korea as eojang. In Vietnam, fish sauce is used widely – as a seasoning, a dipping sauce, in humble daily meals and at fancy parties. Nuoc mam is said to help distinguish Vietnamese food from that of its neighbours. No one knows exactly when Vietnamese people started making and using fish sauce. It was first documented in Dai Viet Su Ky Toan Thu or Complete Annals of Dai Viet (Dai Viet is the former name of Vietnam), a book compiled by royal historian Ngo Sy Lien in the 15th century. The book mentions that in the 10th century, locals made fish sauce and offered the condiment as a tribute to kings. This indicates that Vietnamese people used fish sauce before the 10th century and that it was a well-known specialty that Chinese rulers demanded Vietnam give as payment. Other Vietnamese historical books also recorded nuoc mam as a specialty of some central regions of Vietnam and as a commodity required by the government as a form of tax in some periods of the Nguyen dynasty (1802-1945). In other words, households that made fish sauce had to pay the government a certain amount of fish sauce every year. Fish sauce comprises two elements – fish and salt, the two gifts of the sea. To make it, alternating layers of fish and salt are placed in a wooden vat for six months to a year to ferment. The amber-coloured liquid of the fermentation process seeps down and is drained. American Poet Bruce Weigl who fought in the battlefields of the central province of Quang Tri in 1967 and 1968 during the Vietnam War, waxed poetic about Vietnamese fish sauce in his writing My Own Personal Fish Sauce. Weigl decided to try making it himself at home in the US, becoming known as the “Fishsauce Ambassador”. He has gone from ’being a fan to being a connoisseur’. Fish sauce may smell a bit pungent for foreigners at first, yet once they try it, its aroma lingers in their mind. Fish sauce is used most popularly in cooking, as seasoning accompanying meals and as a dipping sauce. When served with noodles or pancakes, sugar, water, garlic and chili are added to the fish sauce to disguise the strong fish smell. “In a meal of Vietnamese people, rice is like the quintessence from the earth, fish sauce is the quintessence of water. They symbolise the Water and Earth of the five basic elements of the universe (the others being Fire, Metal and Wood),” wrote Them. “Fish sauce is used all over Vietnam, yet no region can use fish sauce more cleverly than Hue people because in Hue (a former royal capital) culinary culture, there are at least 30 different dipping sauces with the main ingredient being fish sauce, featuring a number of flavours - salty, sweet, sour, spicy, balanced, light, strong. It is simply because Hue people have different dipping sauce for different dishes,” wrote culture researcher Tran Dang Anh Son. There are many ways to classify fish sauce in Vietnam, according to culture teacher Nguyen Thi Tuyet Ngan, from HCM City’s University of Social Sciences and Humanities. There is raw or cooked fish sauce; fish sauce in the form of liquid or paste; sauce made from fresh water fish or salt water fish; sauce from fish or shrimp, crab or squid. Besides fish, locals in three regions of Vietnam also ferment crab, shrimp or squid to extract liquid. The northern province of Thai Binh or central province of Thanh Hoa have long been famous for their mam cay (fermented crab sauce). Cay (sesarmidae), also known as red-chileped crab, is found along rivers. In the scorching heat of April and May, the creature comes out of its hole, seeking food. This species is sensitive to sound and moves fast, so catching them is hard. To make crab sauce, a small knife is used to take out carapace from female crabs to take its egg. The egg is often pan fried or stir fried with oil and scallions, and is used as a dipping sauce served with vegetables. Crab is then ground and added with salt and thinh (ground roasted rice). The mix is put in sunlight for a month and the liquid easily seeps down from the crab. Boiled dishes like pork or rau lang (sweet potato’s leave) are paired well with crab sauce. In many regions of Hau Loc, Hoang Hoa, Quang Xuong districts of Thanh Hoa province, crab sauce is used in exchange for other commodities, like rice. Similarly, in the southernmost province of Ca Mau, locals make fermented ba khia sauce. There is a crab species named ba khia, which appears only a few times in October, when the water rises. It is unique to the south, living in brackish water regions. Ba khia, with its carapace taken out and chelipeds cracked, is immersed in salt, garlic, chili, lemon, sugar and sliced mango and star fruit. The mix is ready to be served after a few days when the saltiness has blended with the sourness of lemon, the sweetness of sugar and spiciness of chili. Ba khia paste with its strong taste and unique flavour is paired well with rice and broth, a modest yet tasty treat.